The full nominations list for the 8th season of the African Academy Awards (AMAA) has been announced and as always, Nigerian films and actors do not disappoint to represent as they make a strong showing this year too. The Best actress field had some of Nollywood’s finest listed; Nse Ikpe Etim (‘Mr & Mrs’), Rita Dominic (‘Shattered’) and Uche Jombo (‘Damage’). However, they will receive stiff competition from the Ghanaian actresses Yvonne Okoro (‘Single Six’) and last year’s winner, Ama K. Abebrese (‘Ties that Bind’) also in the same category . Chet Anekwe (‘Unwanted Guest’), Wale Ojo (‘Phone Swap’) and Hakeem-Kae Kazeem represent us in the Best actor category while Hafiz Oyetoro (‘Phone Swap’) and newcomer, Okechukwu Uzoeshi are named in the Best supporting category. 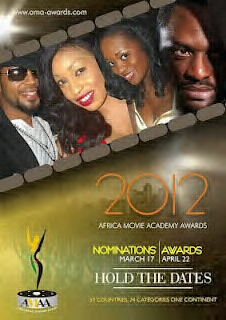 The awards will be held on 22 April in Lagos, Nigeria in a ceremony hosted by Heroes star, Jimmy Jean-Louis. Phone swap is surely a good movie, but i dont understand how AMAA wud nominate a movie dat just premiered two days before the nominees list was released. Is it not suppose to be under review for next year? Or is there something we should know here? Ughhhhhh, the AMAAs seriously need to work on reinvent themselves. I'm so frustrated with the sloppy jobs that are being nominated for so much awards. 1) I wish they would only nominate movie that have been released!!! How else is the public supposed to feel know if the movie is actually good?? 2) Also, really?? Adesuwa?? really tho?? I obviously haven't seen it but the trailer is anything but promising.